From this tutorial you’ll learn how to use Banner JetElements module for Elementor. Image — here you can upload or choose from the media library any image to use as a banner. Image Size — here you can set the preferable size for the banner module. Title — in this block you need to input the title to use it for the banner. Description — here you have to add content to the banner. You can use HTML markup to separate text lines and quotes. Link — here you need to place the link, that will redirect the visitors to another webpage when they click on the banner area. Settings — here you can select the animation effect you want to use for the banner. 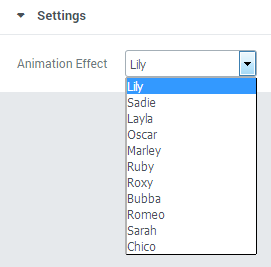 Choose one of the effects from the dropdown list to view it on the page builder screen.